Was not impressed with the quality of the tanks or scenics. For that kind of money c. $200 USD USD why not just play with minis? The chance for this one to go off are – lets say – low. On another note: this entry should not be in the 3d-Print section, as the game comes with painted components, not any files for DIY. Indeed they are going to need something like 6,000 backers to make this a reality. Tall order for what is a niche product. They don't give a scale for the minis, but looking at the video I would guess 1/300. I'm not interested in 3D-printed miniatures. I could be if they were much better than they currently are. Maybe in time. It has taken them 11 days to raise just over $4 USDK. They will not reach even 10% of their stated goal. This campaign is NOT about 3d-printed minis. Apart from that, the good thing about 3d-prints is that anybody can decide wether they want it or not. If I would go through all the forums with stuff that I am NOT interested in and state it there, I would do nothing but… I fail to see the point of such statements. Normandy actually looked like this in '44. 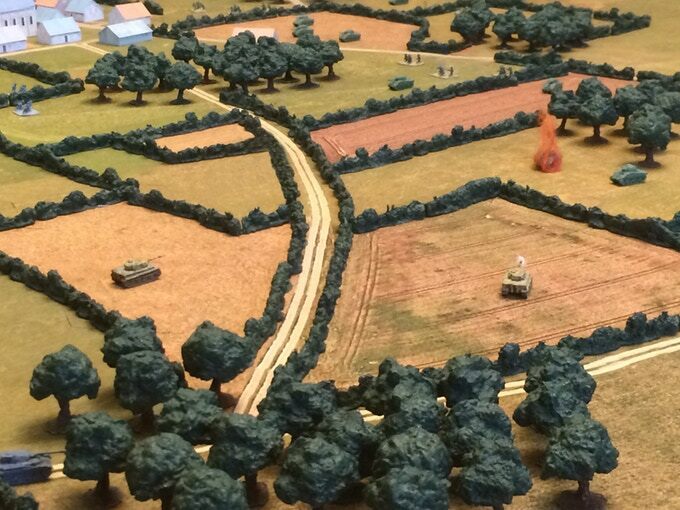 This is a picture of Operation Goodwood after Michael Wittmann attacked.